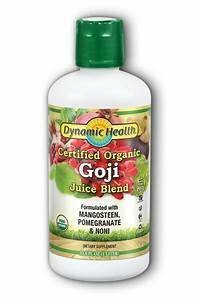 Organic Certified Goji Juice Blend fortified with Mangosteen + Pomegranate + Noni a dietary supplement. The delicate berries of the Goji plant (Lycium Barbarum) have been treasured for centuries by the Himalayan people. These berries flourish in the tranquil valleys that are naturally protected by the Majestic Himalayan Mountains. The nutrient rich soil and the fresh mountain air guarantee nearly perfect conditions for the plant to blossom. Goji Juice, also known as Wolfberry Juice, formerly a Tibetan secret, was used in ancient recipes as a delicious-tasting elixir that provided many natural benefits. Traditionally and today. GOJI Juice has been used as a soothing, yet powerful, health-promoting tonic. Dynamic Health Laboratories, INC's unique Organic Certified blend of Goji, Mangosteen, Pomegranate, and Noni juices creates a powerful antioxidant cocktail that is rich in naturally occurring Minerals (Zinc, Calcium, Germanium, Selenium, Phosphorus, Copper and Iron) Amino Acids (Isoleucine & Methione) & Vitamins. Take 1-3 FL. OZ. (30-90mL) daily on an empty stomach, preferably in the morning or as directed by your health care professional. Sugar, artificial colors and artificial flavors.